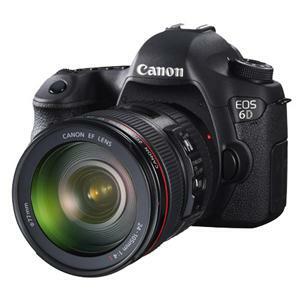 The Canon EOS 6D is a tough, lightweight Digital SLR equipped with a full frame sensor for incredible image detail. The EOS 6D features powerful low-light performance, Canon's DIGIC 5+ image processor, built-in GPS, Full-HD video at 1080p resolution, plus WiFi connectivity so you can control your EOS 6D using a PC, Mac or smartphone and transfer images wirelessly. At the heart of the Canon EOS 6D is a 20-megapixel full-frame CMOS sensor and a powerful DIGIC 5+ image processor. Together these deliver images that are packed with detail and clarity. Colours are reproduced accurately whilst tonal gradation is subtle and natural. Lightweight enough to go everywhere with you and strong enough to withstand the rigors of travel photography. Simple controls and intuitive ergonomics make the EOS 6D quick and easy-to-use. Work intuitively with the EOS 6D’s bright full-frame viewfinder. A 1,040,000-dot 3-inch (7.6 cm) Clear View II LCD screen makes Live View shooting of stills and Full-HD video simple. Built-in GPS determines your exact location and geotags each image file with the information. In GPS Logger mode a record of your route is recorded as you move around, even when the camera is switched off. Shoot Full-HD video at 1080p resolution, taking advantage of fast-aperture lenses and full manual control to achieve cinematic effects. When light levels get low, the EOS 6D keeps delivering superb photography - sensitive enough to operate under moonlight! ISO sensitivity extends from ISO 100 up to ISO 25,600 (expandable to L:50, H1:51,200, H2:102,400) and an 11-point autofocus system is responsive down to -3EV. Preserve detail in both highlights and shadows with the EOS 6D’s high dynamic range (HDR) shooting mode, and create composite images with its multiple-exposure facility. ±5 stop exposure compensation and ±3-stop auto exposure bracketing allow flexibility and fine tuning of exposure. Shoot remotely from alternative viewpoints: connect and control your EOS 6D using your PC, Mac or smartphone. Images can be transferred wirelessly.